"No mention of #IowaCity is complete without referencing Hamburg Inn No. 2, a diner equally renowned for its pie milkshakes (yes, they blend a slice of pie into the shake) and its dozens of pictures of visiting would-be presidents. 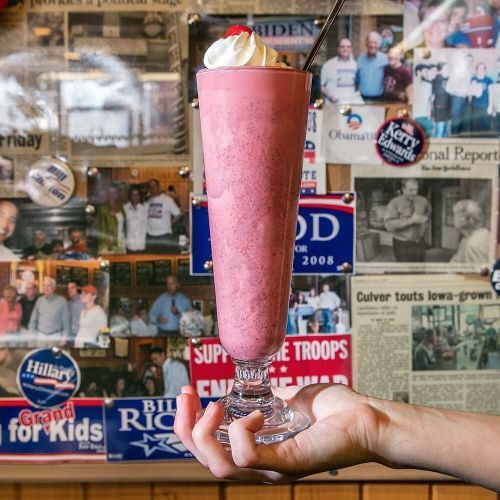 @rdonnellphoto photographed Hamburg Inn's red velvet cake shake for a @nytfood story that explores the dining landscape in the state that kicks off the presidential nominating process. From the King Tenderloin — a deep-fried, pounded-thin pork cutlet that sprawls far beyond its hamburger bun — to the loose-meat sandwich (think sloppy Joe, sans sauce), Iowa dining is often memorable. Follow @nytfood to see some more Iowan culinary specialties. #🍰" By nytimes on Instagram.